Take your log home from grunge to glory in 4 steps. Four circumstances dictate when stripping is necessary: When there is any type of film or coating on the wood, when there’s a build up of old finishes, when there is any area of the house where the old finish is peeling or cracking, and when there is a glossy finish on the house. If, however, the house has had penetrating finishes applied to it, or it has never had anything applied to it or if a gentle breeze blows bits of the finish away, you can skip the stripping process and pressure-wash instead. All four steps are important, but surface preparation is the most involved, most critical and often the most overlooked. House logs need to be clean, bare and dry; otherwise, you will end up doing it all over again because the new finish didn’t penetrate or adhere. Surface Preparation and Stripping. Four circumstances dictate when stripping is necessary: When there is any type of film or coating on the wood, when there’s a build up of old finishes, when there is any area of the house where the old finish is peeling or cracking, and when there is a glossy finish on the house. If, however, the house has had penetrating finishes applied to it, or it has never had anything applied to it or if a gentle breeze blows bits of the finish away, you can skip the stripping process and pressure-wash instead. Bleach and water with a little detergent has been a long-standing recommendation for cleaning dirty wood. It works well, it’s fast and it’s cheap. However, there are a few drawbacks. One, bleach can destroy the cellulose in the wood when left on the surface too long. Two, bleach inhibits the wood’s ability to hold a finish. Three, while the wood will get significantly cleaner, it often still looks gray or an unnatural washed-out color. Four, homemade bleach solutions are difficult to completely rinse from the wood. Household bleach only remains active for about 15 minutes once it’s mixed with water, so you have to use it quickly. Also, when spraying bleach on a wall, start from the bottom and work your way up. This will minimize streaks, which are difficult to remove. Prepared Cleaning Solutions. When you buy a prepared wood solution, look for the active ingredient sodium percarbonate, sodium hypochlorite or calcium hypochlorite. These are all bleaches. However, most store-bought products contain buffers to ease the wood damage and surfactants to help wet the wood quicker and allow it to rinse off easier. If wood is just discolored and has no significant areas of mildew, look for a wood cleaner containing oxalic acid. This mild acid restores much of the wood’s original color. Oxalic acid-based wood cleaners will also remove gray weathered stains, metal or nail stains, as well as water stains. Pressure Washing. Pressure washing is a very efficient way to rinse off a stripper or wood cleaner. However, you must exercise extreme caution when using a pressure washer or you will cause damage to the logs and possibly force water through the logs to the inside of the home. Preserving. The best preservatives for house logs are borates. They are less toxic to humans than table salt and poison the wood as a food supply to just about every wood-destroying organism known, including decay fungi, beetles and termites. However, the wood needs some moisture to allow for proper diffusion, and you must apply and maintain a water-repellent finish over borate-treated wood to keep the borates from leaching out. Given these few limitations, borates become very inexpensive insurance against a host of problems. Wood Finishes. There are several hundred types of wood finishes supposed to protect against organic growth, water absorption and UV damage. A common denominator is the solids content. Solids can be defined as active ingredients or what’s left in and on the wood after the finish dries: resins, binders, pigments, fungicides, etc. A high-quality wood finish will contain at least 30 percent solids, and the better ones contain over 60 percent. A higher quality finish will look good and protect the wood for four to five years between coats. Sealants. The last thing to do is to seal areas that allow air and water transmission. The most obvious places will be where water seeped in during the cleaning process. Other areas where leaks often occur are in the corner notches, around doors and windows, and at the top of the walls. These should all be sealed from the outside, not the inside, using a properly applied high-quality caulk or chinking. 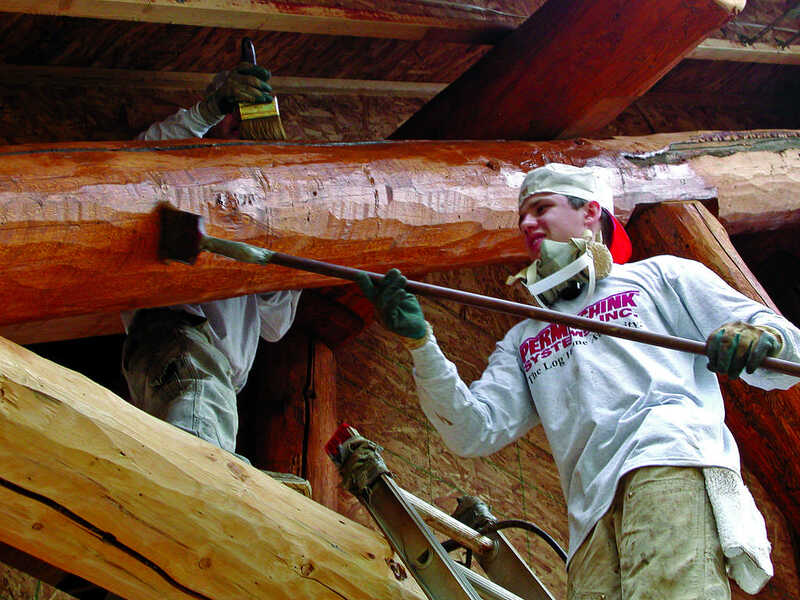 In conclusion, if you’ve just purchased a log home that’s a few years old, then restoration should only have to happen once. Wood can last indefinitely with proper care and periodic maintenance. Taking care of the wood you own is an investment, not an expense. And it’s smart money. Jim Renfroe has spent more than 35 years in the wood preservation and restoration business and is the author of The Log Home Owner’s Manual. His company, Wood Care Systems (ewoodcare.com, 800-827-3480), is located in Kirkland, Washington.